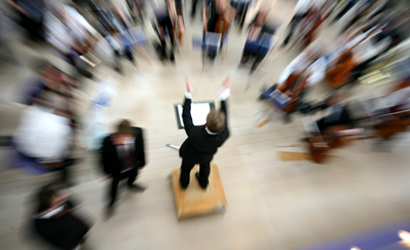 One of the most obvious forms of leadership, one that is judged immediately based on the performance that is generated from the team there and then, is that of the conductor of an orchestra. Even here at WPP, the internal senior leadership course is called Maestro, and the take home gift is a conductor’s baton, the implication being that as a qualified maestro leader, you are able to conduct your team to generate results while allowing the individual freedom they require and, indeed, the team requires. Great stuff, and even better to see it brought to life in such an entertaining way. of foreclosed conclusion. Thanks for your posting.